Leaking Roofs: Effects of a Roof Leak | Hoyt Roofs, Inc.
A leaking roof can be the start to a very big problem. 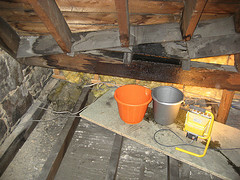 Not only can a leaking roof require to fix the roof itself but It can damage a wide range of things around and under it. Structurally other issues in the building can be caused by a leaking room. 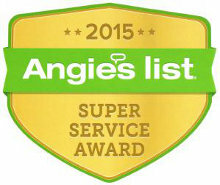 Things like damage to the walls and ceiling causing dry rot and discoloration of paint and sheet rock. The best way to deal with a leak is to stop it as soon as it is discovered and fix all affected areas. If you want to do some preventative maintenance be sure to check the top ten places that roof leaks can be found. 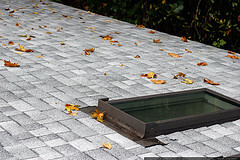 If a skylight is not done properly it can be the cause of a serious roof leak. 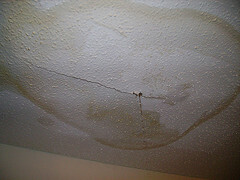 Here is an example of some damage that can be caused by a roof that has a leak. This is what water damage on a ceiling looks like! This entry was posted on Monday, December 20th, 2010 at 8:40 pm	and is filed under News. You can follow any responses to this entry through the RSS 2.0 feed. You can leave a response, or trackback from your own site.